The beginning of a new year is always great for the players in Oz because it is a time of anticipation and counting days to CanCon - huge gaming convention. Second year in the row CanCon will also host Clash of Kings 2018 tournament for Kings of War players. Hence a lot of them are busy now with painting or practicing or both! It happened that my good friend, Michael, needed to test his most recent version of Kings of War army. I have not played since Masters so some practice would only mean good thing for me too. 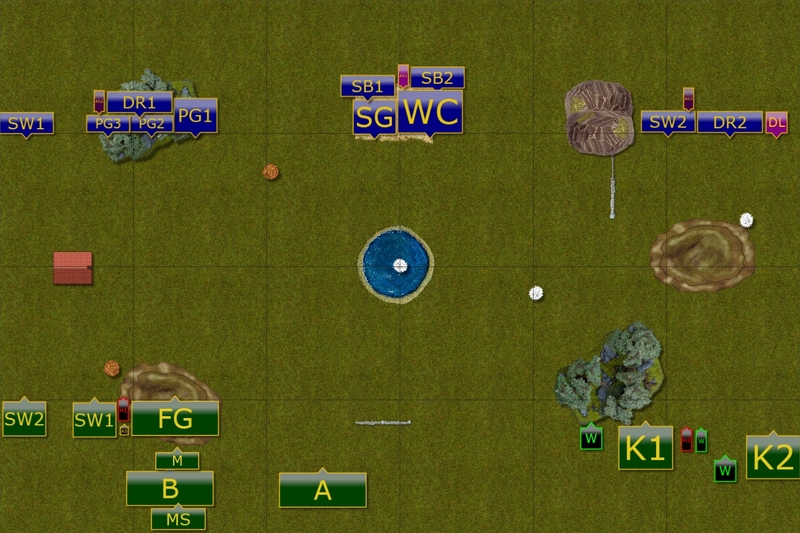 We thus set up a game on Universal Battle! I think this is a very flexible army, with a lot of strong points. It has three horde units that have some staying power even if two of them have low defense. It has supporting units in the form of Shield Wall and Militia that can control objectives and let the tougher elements do the fighting. It has ranged attacks with very dangerous horde of Rifles and fast and maneuverable wizards. And it has two regiments of very reliable Knights. 40 Foot Guard - on its own this unit is a very good defensive formation thanks to defense 5+ and good nerve. However, with Brew of Strength upgrade they are much more flexible as they can also hit back. 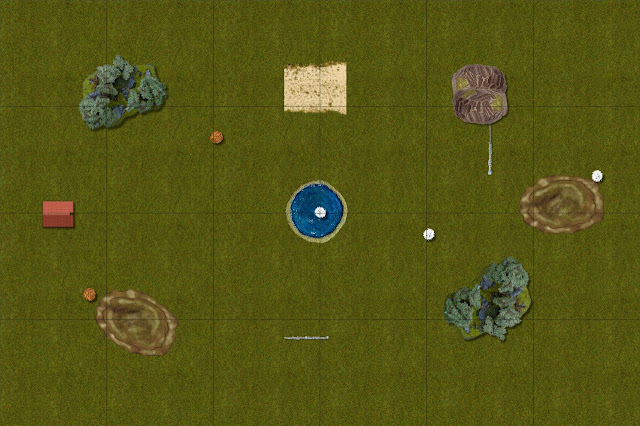 With base 3+ to hit they can also fight in the terrain well. 40 Berserkers - this unit on the other hand is a purely offensive force. They can comfortably front charge many enemies and damage them badly. They cannot be wavered so are very reliable. However, with low defense they still need some protection to avoid being shot at. 40 Arquebusiers - ranged support of the army, even more dangerous with extended range to effective 36". 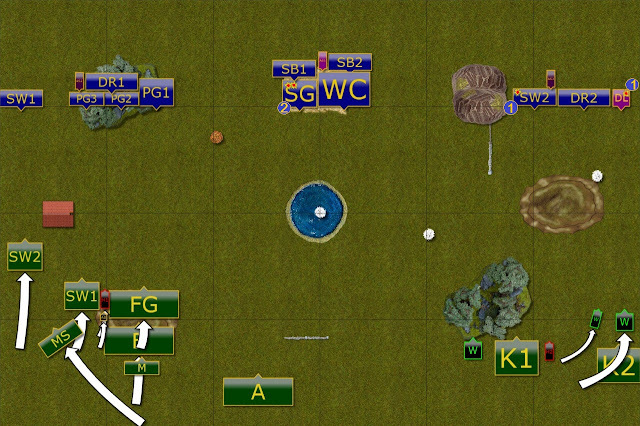 Although cannot move and fire, their good range allows to cover quite a significant amount of battle field. In order to limit the damage from this unit I would need to use the terrain a lot. 2 x 20 Shield Wall - typical human infantry without special rules. They may look average but are still reliable. They can protect the flanks of the hordes, block the enemies from attacking other units or control the objectives so that more dangerous units do not have to be held back. 2 x 10 Knights - much needed faster elements of the army, the knights are very reliable force both in attack and in defense. They can also threaten enemy infantry that may be a bit faster than the human formations and to limit the possibilities for maneuvers of the foe. 5 Mounted Scouts - fast and maneuverable support, scouts can add a few shots where the enemy may be already hurt and limping away from the battle field. Or try to engage with some skirmishers fights to help to get rid of the enemy light cavalry. 10 Militia - last time there were 4 units of these but this time only one unit made it to the list. Very useful unit and last game showed that they can even rout enemies if they are ignored and allowed to attack. 3 Wizards - each one of them is equipped with Lightning Bolt spell, giving total of 11 Lightning Bolts per turn. These can be either focused on a single target or spread the fire, accordingly to the situation. Very fast and maneuverable, in particular when mounted on Pegasus. However, that makes them more vulnerable to shooting so they have to be used with care. Army Standard - another source of inspire in addition to one of the wizards and also bringing Bane Chant (2) - that adds flexibility to the shooting phase where there is a choice in between 3 Lightning Bolts spells and 2 Bane Chants to help against better armored targets. 2 Heroes - last but not least there are two heroes in the army that can be very annoying and disrupt enemy ranks. Be it in terms of shooting or denying Thunderous Charge bonus, for example. They can be even more efficient than the Army Standards I use in the same roles. In general, this is one of the armies I cannot out deploy and have more staying power than mine. The advantage I may have over it lies in the speed and maneuverability department. This is a good thing because I try to focus on that anyway. I wanted to make Rifles my priority because every turn they shoot I may be removing one unit. I had to anticipate their position and my intention was to either bring my own shooters to the ranged attacks duel or get fast unit to disorder them. Melee was inevitable so the plan was to use speed and maneuverability to pick the fights where I can either block the enemy units or bring enough force to defeat them. For instance, if I could charge with three units of Palace Guard against single horde of infantry, I should be able to defeat it at a cost of one or two of my own. The exchange I was willing to make in order to get rid of the powerful enemy. However, I needed to be careful as exchanges unit-for-unit in general would benefit Kingdoms of Men army. We got "Occupy" as a scenario this time. The primary objectives are orange while secondary ones are white. Interestingly, we ended up with both, primary and secondary objectives on separate halves of the battle field. I thought that it would attract greater number of units on the left flank as controlling two of the primary objectives allows to win even if the enemy controls the other three but secondary ones. I won the roll off for the sides and picked North, mainly to deny good, central placement of the difficult terrain that Riles would occupy for sure. I decided to group all my shooting with the banner that has Bane Chant in the middle. First reason was to be able to catch up with the Rifles as it was not clear for me where they may end up. Second, if the clear line of sight was not available to that unit, being in the middle should help in picking other targets. I tried to use the terrain as much as I could. 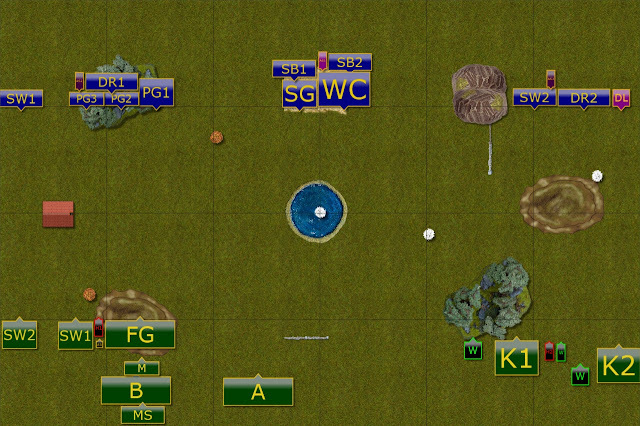 I positioned the infantry on the left because starting from the forest they would be able to get some protection and at the same time would allow me to advance together to attack as one. Seeing that Michael is deploying a lot of infantry there I added Storm Wind and Drakon Riders to help. However, the main goal here was to stop the advancing enemy from reaching "my" primary objective. On the opposite flank I also faced a challenge because two regiments of knights alone were more than a match for my units. But with the support of wizards I may not have much time to maneuver around or play waiting game. Despite that I had to try and slow them down too in order to prevent them from controlling the objectives and from outflanking my shooters. In the end I decided that I need to focus on eliminating the Rifles with my own shooting and to play patiently on the flanks. Once the Rifles are gone my faster and more maneuverable units would have much more freedom of movement to create local superiority and to try and attack one unit at a time. However, I needed to do that relatively fast as I may have run out of time and flanks would not hold forever. The army of Men seized the initiative and move forward. 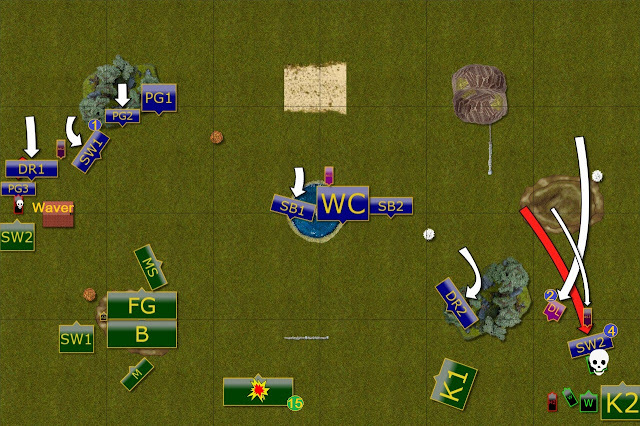 On the left flank the infantry moved boldly, with Shield Wall rushing to block the narrow passage. On the right the knights waited patiently while the wizards tried to pick their targets. While in the center the Riles aimed at Sea Guard and inflicted some damage. As it became clear that Elven Knights cannot fit in the narrow pass, some re-positioning was required. Palace Guard troop was assigned the task to guard the pass while the cavalry was waiting for an opportunity to intercept advancing enemy. 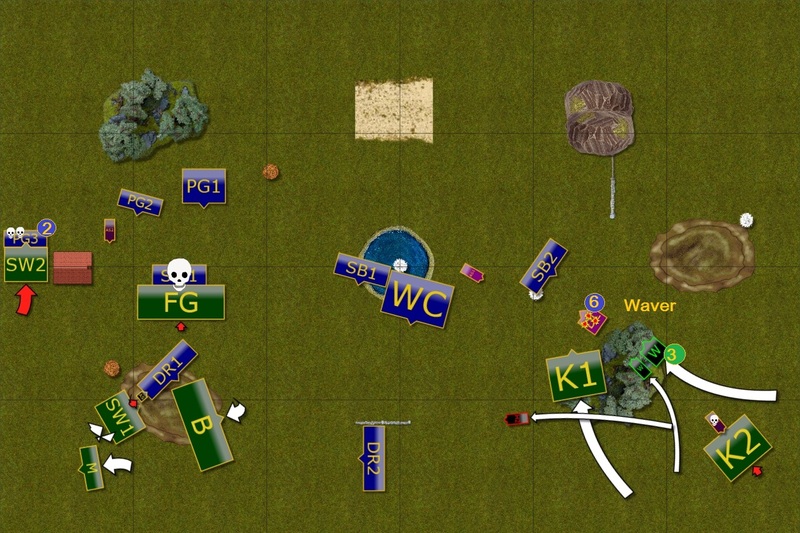 The units in the middle were a bit too far from the Rifles to shoot at them so those who could reach the wizard in the forest shot at him. Last but not least, the fast units on the right flank advanced slowly and stayed in the shadow of the hill. 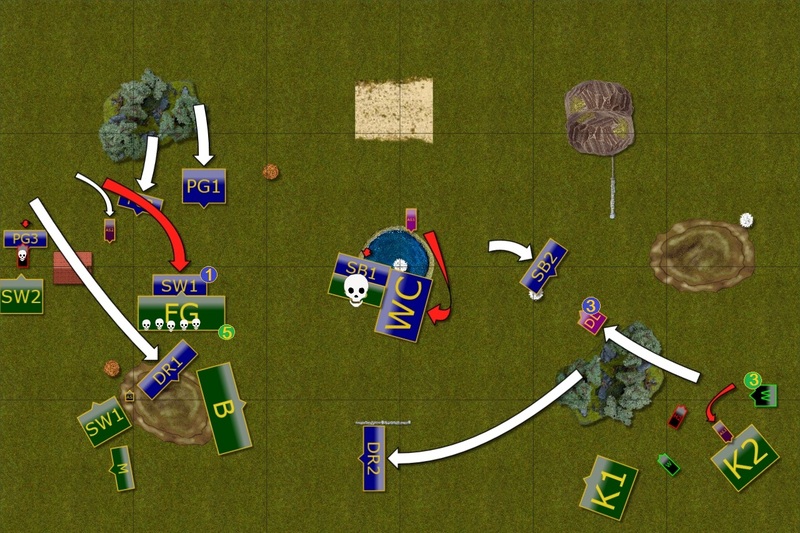 The infantry formation on the left advanced towards Elven units with the exception of Shield Wall that pulled back a bit to avoid being charged by the enemy. 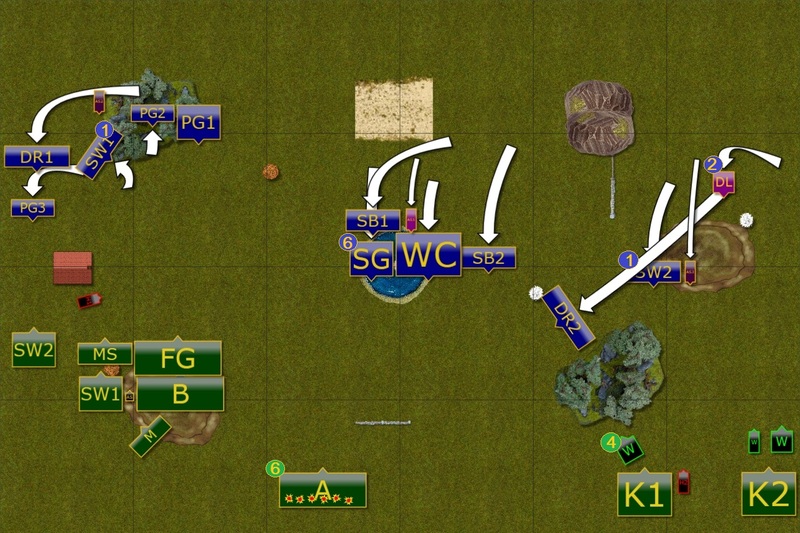 The Rifles kept shooting at Sea Guard and inflicted more damage (Edit: Apologies for not changing the number of damage points on the map, it should show 6). Surprisingly on the right flank the units pulled back a bit and two wizards continued casting spells. Unfortunately, they were quite inefficient and didn't do expected damage upon the Drakon Lord. Maneuvering for better position continued. On the left flank the Palace Guard got supported by Drakon Riders. At the same time, all units in the middle shifted towards their primary target and started shooting at the Rifles with good effect. Using the opportunity and passiveness of enemy knights, Drakon Riders on the right flank moved towards the enemy center using the forest as a cover. At the same time the Storm Wind and Drakon Lord were guarding the back yard. Shield Wall and Hero block the pass now and wait the reaction of the Elves. At the same time the rest of the infantry stops the advance and occupy the objective. 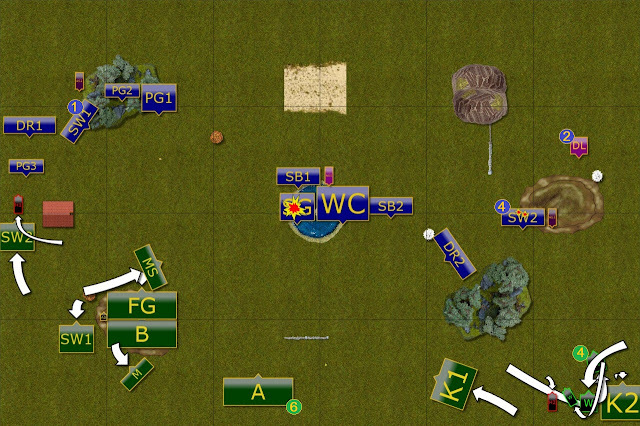 The Rifles open fire at Sea Guard for the third time and inflict enough damage to rout the unit. On the right flank one unit of the Knights moves to intercept the Drakons while the wizards and second unit of Knights pull back. Once again, the Lightning Bolts seem to be very inefficient and Storm Wind cavalry remains intact. The Rifles go down too! 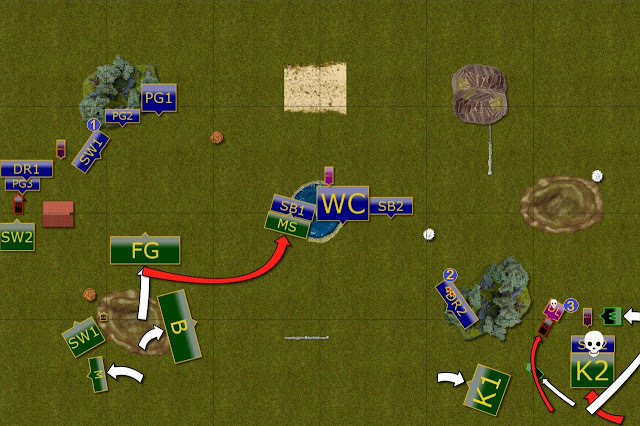 The maneuvering continues and this time brings some benefits to Elven army too. On the left flank the Palace Guard attacks and wavers the Hero of Men and that means the Shield Wall behind him is also blocked. 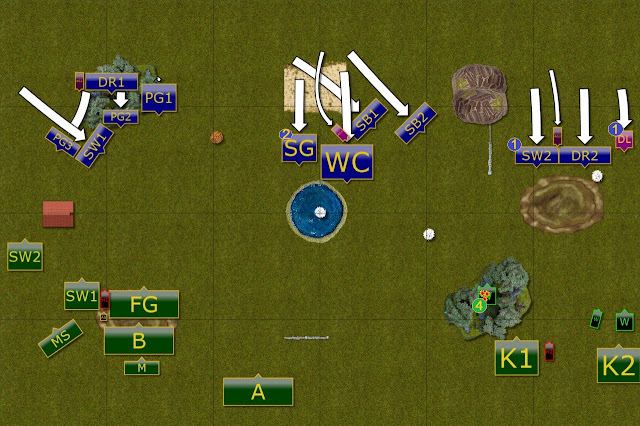 In the middle, three units of Elven shooters aim at the Rifles all together and this time the damage is even more significant. What is more, the enemy unit is isolated and without support and is routed! On the right flank the Drakon Riders move to the forest to avoid the enemy Knights, while Storm Wind attacks wounded wizard and routs him. It also means that the second unit of Knights is blocked for now. The army of Men had to respond quickly after a big whole in the middle was created. On the right flank the Knights routed Storm Wind and hero managed to ground the Drakon Lord. The wizards aimed at nearby Drakons too but did not inflict that much damage, the cover provided by the trees definitely helped. The conflict intensifies as more units are committed to melee. Palace Guard on the right gets rid of the Hero but needs to brace for impact as Shield Wall will definitely charge them very soon. Storm Wind cavalry intercept advancing Foot Guard in order to buy time for the remaining Palace Guard to get into positions to attack as a second wave. In the meantime, the Drakon Riders find a perfect landing spot behind the enemy lines. 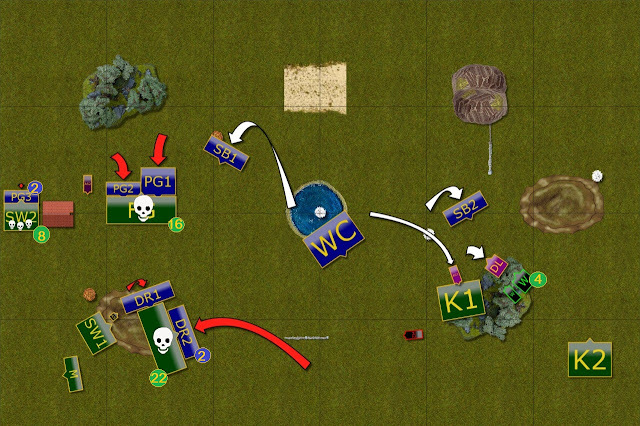 Their companions advance swiftly from the opposite flank and that puts Berserkers in a very bad situation. In the middle, the Chariots help to get rid of the mounted scouts and Elves hold to the objective there. And on the right flank the brave Army Standard buys time for the Drakon Lord to limp away behind the protective forest. The units seem to be engaged across entire battle field now. On the left the Shield Wall attacks Palace Guard but does not inflict that much damage. On the other hand Foot Guard has no problems in routing Storm Wind cavalry and uses the momentum to move towards Palace Guard units behind it. The Knights on the right try to catch up with Elves while the wizards chase the Drakon Lord with lightnings. This time he gets wavered! Powerful attack on the left flank. (Edit: After the movement phase we realized that we played for longer than expected and Michael had to stop. I decided to just roll the dice to see what is going to happen in melee phase). The Palace Guard units attacked Foot Guard. The powerful enemy unit advanced away from the inspiring presence of the army standard and that gave Elves a chance. They got lucky and managed to defeat enemy foot knights. Drakon Riders teamed up versus Berserkers knowing that they need to scatter them before they can retaliate. That allowed the Elven army to gain a significant advantage and the enemy withdrew. Many thanks to Michael for a game and apologies that it took longer than expected. I will do my best to speed it up so that we have enough time to finish 6-7 turns. I managed to gain advantage in turn 5 and I hope I would have been able to keep it. On the left flank there were still unit to deal with but I think Drakon Riders would have held and then advancing Palace Guard had a chance to fight for the second primary objective. The situation on the left was in Michael's favor. His Knights should have reached the rightmost objective and the wizards would be able to get rid of either Silver Breeze or Drakon Lord. The second unit of Knights should rout the Army Standard and then it is a matter of playing 7th turn. In general, I was glad I put up a fight and that this time the plan worked. 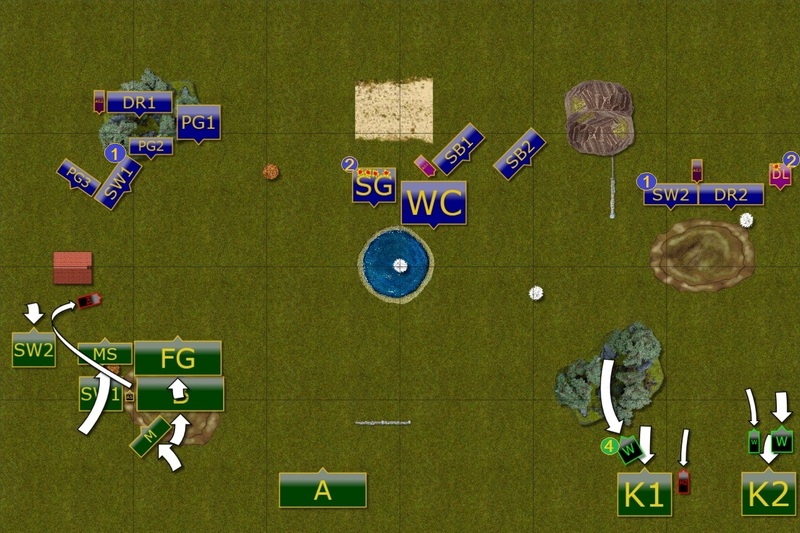 It was not easy because my own shooters where too far to aim at the Rifles in my first turn but I managed to get them in turn 3. That was very important as it allowed more freedom of movement and the Drakons were free to surround Berserkers. That also freed the units to contest or claim the objectives as Silver Breeze units and War Chariots did. While the amount of damage my units suffered from the Lightning Bolts was less than expected, I still offered clear line of sight to my Drakon Lord. I need to correct that. In addition, when I moved him close to the enemy units, he should have landed in the forest. That further helps to keep his maneuverability as the hero who attacked him would have been hindered. Fortunately, I had enough movement with Brew of Haste to get him behind the forest. I think Michael's army is a very good force and that he was a bit too shy, in particular with the Knights on the right flank. And who knows, maybe we will face each other again, this time during the event as the last year! Nice report, congrats on the win. Can I suggest you re-print your own army in the battle report? I know you tend to use the same one all the time, but it can be hard to remember what is in the force. Thanks! Also for the reminder about my own list. I completely forgot about it! Your use of the drakon units in this game was a thing of beauty. MSU at its finest! Three infantry hordes must be really tough to play. I’ve never tried it myself but they seem very unwieldy and difficult to protect. Add in the fact that KoM is a tough list to play as well. I’ve tried to make a few lists for that army but nothing ever “wows” me. I’m guessing he pulled back with the knights respecting the threat range and ability of the units to disorder them. Knights are great but disordered against def 5 is an uphill battle for them. I guess that is what you have to deal with when playing KoM. Their units do not necessarily have that effect on the opponent. However, they are very good because their army can be very versatile and flexible. I agree with you that the Knights may have had a tougher time to get rid of defense 5+ enemies without their lances but if they managed to get into one-on-once combats they would have prevailed. Or at least pinned the units down!